I want to set some information out there, and while there are a few who will agree, and some who will rightfully express that this is something they have been saying for years, the information needs to be spread far and wide. Misinformation abounds in the self defense industry. This is due mostly to self-appointed experts, and generations of people teaching what they had been taught without scrutiny and a mind for critical thinking. There is also the fact that violence is not really understood by very many people in the martial arts world, but there is some extra money to be made if you promote and teach garbage self-defense classes. Real violence is ugly. The “attacker” who steps and grabs you by the wrist is not out there. They guy who steps up behind you, sucker punches you into unconsciousness and robs your motionless body is out there. As the subject is huge, and very important, I am going to approach it from several angles, and hope something sticks in the mind of the beginner, and seems important enough to be passed on by the seasoned instructor. Take for example the common claim that high kicks are not effective. I have knocked people out with head kicks in sparring, tournaments and even in physical conflicts. They do work. The issue is speed and timing, as well as minimizing the telegraph of your intent. 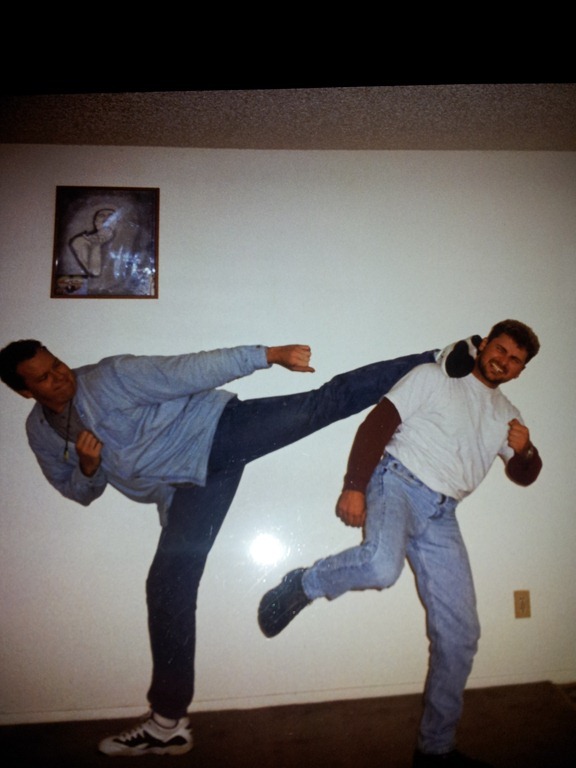 In the photo above, my longtime student Jeff is attempting a kick to my knee. What was the situation? Was he trying to kick my knee and I responded by trying to kick his head? If so the kick to the head would likely arrive to late, if at all. 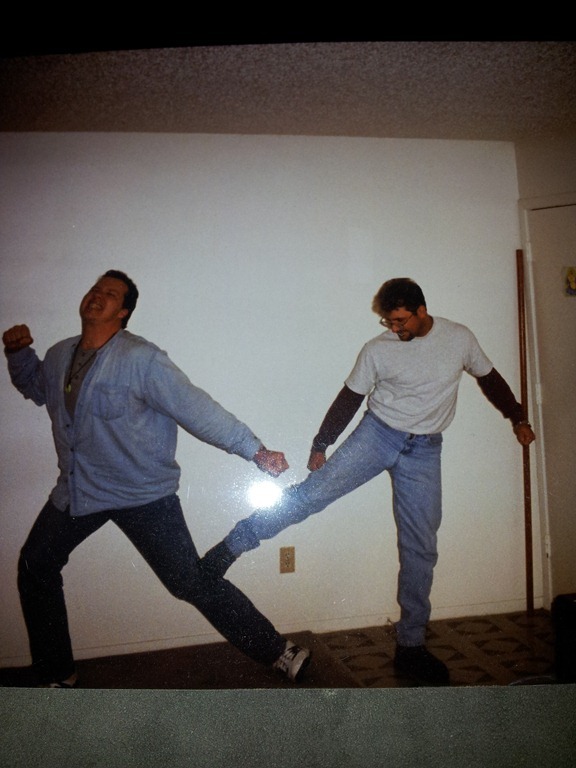 Did I initiate my kick first and he attempted a shorter route kick to the knee as a counter-attack? If so, my chances for success rise dramatically. Also note the pivot of the base foot, so often taught as a balance aid, also minimizes the knee damage I take in the event his kick gets to me before the knock out. Are head kicks the best technique for self-defense? Absolutely not! The problem with discussing self-defense is that there is so much that people think they understand, have heard and taken as Gospel truth. Violence and Self-Defense are subjects so big that no one person has all of the answers. Low kicks arrive at the target faster, and in many cases will end the fight. But in the world of self defense, nothing is 100%. As soon as you think you have all of the answers, you are in trouble. When you know everything, some teen with a gun can take you completely out of your element and remove all of your confidence and skills from the equation by simply changing the question. Violence is ugly. It is not the antiseptic version you find taught in most dojo around the world. A guy steps out of a shadow and caves your skull in with a baseball bat. A guy steps up behind you and opens your throat before you knew the guy or the knife even existed. A guy asks for directions and as you look to point out the right way he sucker-punches you into total confusion or unconsciousness. The fact is so simple that most people miss it. The physical techniques are what you need after you have done everything else wrong. Do not focus on the last resort! Focus on what is important. You need to be aware of your surroundings. You need to be aware when someone is staring at you. You need to be unafraid and see what is going on, but above all, you need to be here right now. I love technology as much, if not more than most of the people I know, but there are things I see that baffle me. I have almost run over three people in the last two weeks who were more interested in their phone than paying attention to the cars driving near them. If I ever were to become a criminal, I know that the easiest victims would be those people absorbed in their tech devices. And if I know this, the criminal knows it even better because it is how they find resources, to me it is just speculation. You have to be able to tell if the situation is a monkey dance (social violence: hierarchal dominance) or the human predator (falls in the category of the very scary asocial violence). You have to know when you are in a situation where your normal is not normal here. It is a huge subject, and it is not going to be fully understood in five easy lessons, or a two hour seminar. If you are interested in being safe, there are some people out there who know the subject and are teaching the truth. If they start with and get stuck on the physical, then you are wasting your time and need to move on. For a final word in this essay; be careful in who you trust. There are many people who claim to know the subject of violence inside and out, but have never been in a real conflict in their entire life. Sparring is not fighting and the Dojo is not the street. Remember, the physical is what you need after you have done everything else wrong. Learn first how to do the initial stuff right. Awareness and avoidance, de-escalation and recognition. These are more important by far than what to do if Johnny Badguy grabs your wrist.